Hotel in Biloxi-Ocean Springs, Mississippi Near the Mississippi Gulf Shore. 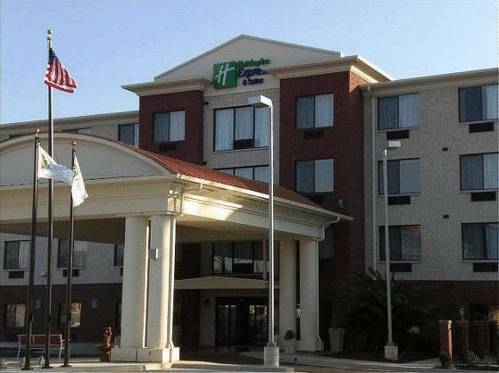 Welcome to the Holiday Inn Express Hotel & Suites in Biloxi-Ocean Springs. Our hotel is located right off I-10 near the heart of downtown Ocean Springs, convenient to all that the Gulf Coast has to offer. Vacationers to our smoke-free hotel can enjoy a wide range of area attractions. You can enjoy the beautiful Gulf Beaches only a few miles away. Play golf at your choice of premium golf courses or experience the Biloxi nightlife and entertainment at the Casinos all just minutes away from the hotel. Nearby businesses within a half-hour of our hotel include Northrop Grumman, Dupont, Keesler Air Force Base and Chevron. Both the Biloxi Regional Hospital and Mississippi Coast Coliseum are also nearby and convenient. Relieve stress by exercising in our fitness center, or swim and relax at our outdoor pool. If you require Group Meeting facilities we can accommodate up to 45 people. Wifi Internet access is available in our lobby, business center, and all guest rooms. Start the morning off right with our complimentary Express Start breakfast. For business or pleasure, Stay Smart at the Holiday Inn Hotel & Suites, Biloxi-Ocean Springs MS.
El Rancho Restaurant: Mexican Restaurant across the street. Childrens's program - Kangarooz, inflatable play place. Big Play, miniature golf and go carts. Cypress Lanes, bowling. Lynn Meadows Discovery Center, Children's museum. HIX-MR: Meeting room may accomodate up to 40 people theater style. Amenities in room to include wet bar, television, and DVD player. Downtown Ocean SpringsVoted #1. One of the oldest cities in the U.S. offers one of a kind charming restaurants, boutiques, and activities for all ages. Golf CoursesClosest course is Gulf Hills. There are MANY GOLF COURSES WITHIN A 10 MILE RADIUS, INCLUDING THE FALLEN OAKS AND THE MOST RECENT THE RESERVE. BEAUVOIR, The Jefferson Davis HomeJEFFERSON DAVIS HOME AND PRESIDENTAL LIBRARY. STUNNING HOME OF THE ONLY PRESIDENT OF THE CONFEDERATE STATES . NASA Stennis Space Infinity CenterVisitors will hve fun exploring the farthest reaches of outer space, the uncharted depths of the oceans and the varied layers of the Earth. Ohr-O'Keefe Museum of ArtSEE THE GREAT WORKS OF THE MAD POTTER OF BILOXI GIFT SHOP ON SITE--PICK UP A ONE OF A KIND PIECE OF OHR!!!! !